"Philosophy is a way of thinking about the world, the universe, and society. It works by asking very basic questions about the nature of human thought, the nature of the universe, and the connections between them." "What can I say? I'm addicted to the philosophy forum. I spend most of my day obsessively on the philosophy forum. What have I gained from this time? Not much. I create many discussions that I don't even get involved in. I bombard this forum with discussions and it probably annoys some people. I don't even read what people write most of the time, I just skim through their posts. Most of the time, I don't even understand what people say. Some people have said that I should try to improve my concentration, but improving my concentration and reading comprehension has proven to be very difficult for me, almost impossible. So I really don't see me getting much out of this forum. I'm precisely addicted to that number on top of the tab, telling me that someone has responded to what I've said. It's like a slot machine, I never know what I'm going to get. I suppose it also boosts my self-esteem when someone responds to what I have written." What can be said about such an admission? Well, the person doesn't have an exclusive patent on the sentiment because I've seen it in varying degrees in others and with myself when I started participating in online forums back in 2000. The difference with me - and perhaps an 'old school' difference at that - is that I didn't create discussions just for the heck of it and not get involved. I read through the posts and understood what was being said unless it contained technical terms which I was not aware of, and I don't remember having to particularly improve my concentration and reading comprehension (though I certainly consider improvement an ongoing element at any level). In any discussion it's best to know the elements of it as fully as possible and especially the terms employed in their explanation. Those of you who have had experience with online forums probably already know about encountering the white-water rapids of semantics in exchanges and sorting through that can often take more time than the topic at hand. The second paragraph of the poster's quote can be emblematic not only of an online forum but of the web in general. Whatever you see on the web boosts the self-esteem of someone in one way or another. At a basic level the participant feels he or she is doing something. On other levels, that 'something' can become complicated, i.e., the esteem of a hacker is not shared by those who were hacked. With that and others' aspects in mind then I would have to echo the sentiment in the forum introduction post: Why a philosophy forum? 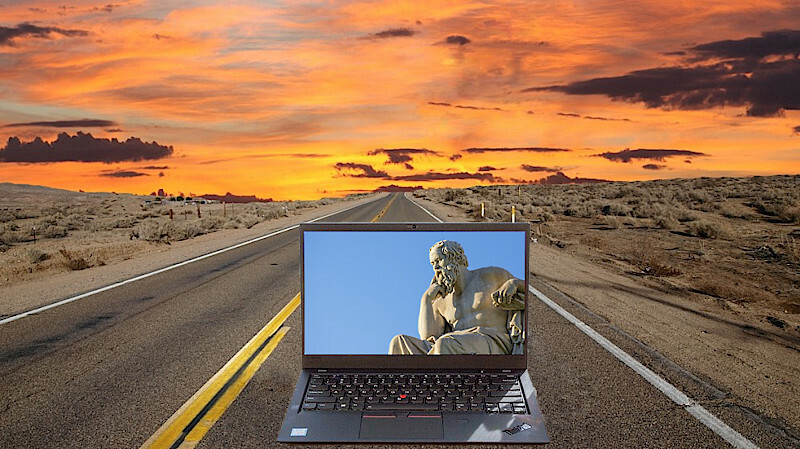 The idea of adding a philosophy forum stems from when I participated in what is now regarded as the original forum for philosophy, 'philosophyforums.com' (PF), which was designed and administered by Paul Knierim. I joined PF on July 1, 2002, two and half months or so after it started and what I liked about the forum was that the members would be substantial with whichever topic was being discussed and write a few paragraphs if necessary in a post to explain their views. For me it was nice to see that and more substantial than other forums I had seen and especially "chat" rooms which at that time were still around but the writing was already on the wall as to their demise. PF may have been preceded by other philosophy-oriented websites but Knierim's version eventually got the most members to where 50,000 people registered. I left way before it got to that number, whether it was from burnout or simply just moving on is irrelevant at this point in time and doesn't take away from the interest in it back then. The forum lasted for more than a decade then it was sold to others. From what I've gathered here and there online the new owners seemed to have a Keystone Kops attitude to it all and ultimately PF went offline. Recently, I looked around online to see if I could find anything about PF or what Paul was up to. I figured that maybe some of the current philosophy forums would have former members and maybe even Paul. Sure enough, I got lucky by finding, 'thephilosophyforums.com' (TPF). Some of the members are from PF back then and addedly Paul had visited occasionally. I posted something on it and Paul answered with some brief details about what happened with the original PF. I told him that I thought about a possible reunion of the original PF forum members, that it would be interesting to learn how others from the forum had fared philosophically or personally in the past 17 years. Needless to say, it's a long shot trying to find the original members of PF and as Paul mentioned some of them may have already passed on to worlds and forums in other dimensions. Nonetheless, I think it could be interesting and even if only 20 members or so are found then that would be worth it. Note: When I say, 'original members', I am referring to the first 3-5 years of PF. Here are some names from the original PF: Aniket - Baron Max - Colleptic - DarkCloud - denial - Distortion - Fire drill - geoff23 - Gotmundsdottir - i know - Interlocutor - Libertarian - mrmike - Myth - Nihilistic Locomotive - Prime Directive - ralldurai - Rigor_Mortis - Sharif - steve - the_visionary - Tobias - Wax - Xev - xxuxx, and of course, Paul. Let's see if through the magic of SEO, metatags, word of mouth, and good ol' cosmic coinkidinks some of them read about it wherever they may be. By the way, on PF I was known as, 'Spaces'. I leave you with a quick story: Many of you may be familiar with Robert Monroe. He wrote books on out of body experiences he was having and they are fascinating whether you believe in such or not. Years ago, probably not too removed from when I first joined PF, I happened upon a radio interview with Monroe (It was his last one before passing away in 1995). As the interview was finishing the interviewer asked Monroe if he had any last words to say to the audience and immediately you could hear Monroe in the background saying, "Yes, yes". Monroe then proceeded to describe the life we live as being a small town. There's a highway offramp that goes into town and that is your 'birth'. You then live your life in the 'town' and at some time you will get on the onramp out of town, 'death'. Monroe wanted the audience to remember that when you get on that onramp to the highway leaving town, things will be "Very, very, different". This piece is repeated in the forum and the reason I have also placed it here is if anyone wants to comment only using the Disqus form below rather than the process of registering to the forum to respond there. Registering is easy though I have set it up with notification to me before members can post for the first time. After I receive notice about a registrant then I immediately notify him or her that they are able to post, etc. UPDATE: Registrants thus far: Paul, Tobias, Geoff23, Distortion, and me. Tech: Code validation aspects for 'A Friend Visits - October 2018'.